These Dunlop Safety Rigger Boots have been designed with a heel support system for extra stability, along with a chunky oil-, acid-, and slip-resistant outsole for extra protection against spills. 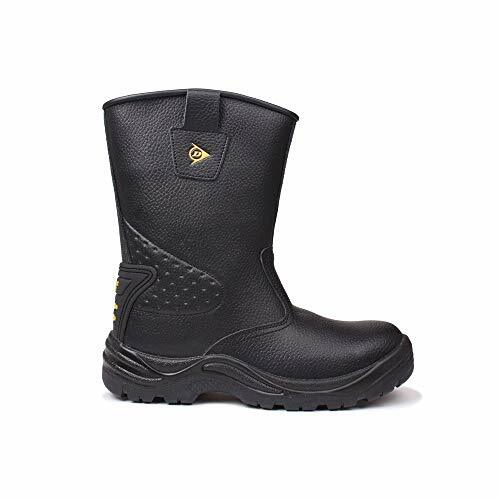 These Dunlop safety boots also feature a steel toe cap and mesh lining for extra ventilation. Pull tabs to the sides. Mesh lining. Oil-, acid-, and slip-resistant outsole. Steel toe cap. Support system heel. Waterproof. Toecap impact protection: 147.5 ft.-lbs. (200 Joule). Compression (Crushing rating): 3,372 lbs. (15,000 Newton). EN ISO 20345:2011 SB SRA. Coated leather upper, textile inner, synthetic sole. Imported.